The figure-1 depicts CWDM based fiber system. As shown it is used to transmit 4 different applications using single optical finer instead of pair of fiber cables. Different applications are using different light wavelengths which helps in multiplexing and de-multiplexing applications at transmit and receive end. The figure-2 depicts DWDM system consisting of transmitter and receiver parts. 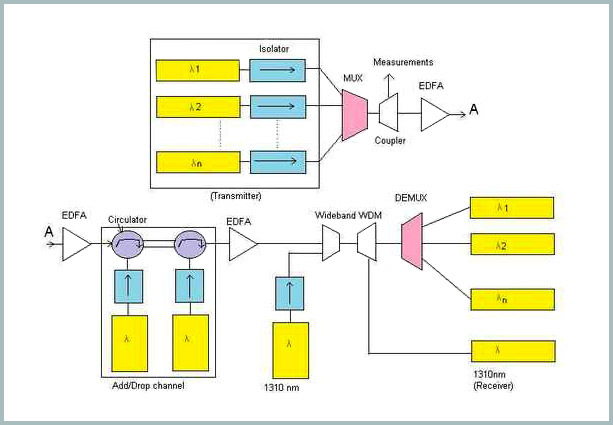 Typically DWDM consists of MUX, DEMUX, isolators, circulators, EDFA (Erbium Doped Fiber Amplifier) etc. Figure-3 depicts spectrum of CWDM and DWDM technologies. As shown DWDM spectrum will have tighter wavelength spacing between the channels compare to CWDM counterpart. Following table compares the two.